Drawing from extensive experience in providing first class cherry pickers for hire in Kent and across the South East of England, as well as a number of other high level access platforms, MC Property Maintenance specialise in providing everything you need to complete a painting and decorating project on the exterior of your property. With machines available for both long and short term hire and operators for hire where necessary, MC Property Maintenance provide our cherry pickers to both residential and commercial clients, from painting the exterior of your property to larger construction works where a more versatile machine is needed. Cherry pickers provide a cost effective and far less intrusive alternative to scaffolding when conducting maintenance and cleaning works on a property and they can be used on both the interior and exterior of any property. High level access platforms are flexible and versatile, allowing clients to perform decorating and maintenance projects in areas such as shopping centres and even churches, as well as factories and construction sites. With our expert team you will receive support and assistance in finding the best high level access platform for your needs. Offering a number of high level access operating, painting and decorating services, MC Property Maintenance ensure that clients have everything they need when looking at a high level decorating project. Based in Bognor Regis, MC Property Maintenance draw from extensive local experience working with a number of clients in Kent and further afield in order to ensure complete client satisfaction in every project we assist. MC Property Maintenance is an officially registered IPAF and CPA company, assuring the safety and quality of your workers and equipment at all times. We take pride in our ability to provide organisations both large and small with expert and high quality powered and self-operated platform equipment, whether you require assistance in a construction project, or for a small residential decorating service. Operated Hire – Our operated hire is ideal for both residential and commercial clients looking at taking on a long term building project. As a cost effective solution for long term projects, we provide expert operatives with the hire of our high level access platforms in order to provide essential advice and assistance throughout the project. Property Maintenance – MC Property Maintenance also provide a number of property related services in addition to our operated hire and self hire cherry pickers. Our services include high level access painting and decorating services, gutter cleaning, the treating of woodwork and more. The continual upkeep of your property is essential, particularly for commercial properties, so we take pride in ensuring complete client satisfaction in our services. 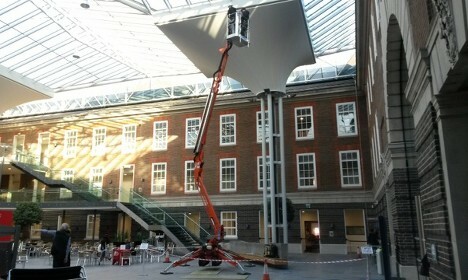 MC Property Maintenance offer both commercial and residential clients a range of first class cherry picker hire services in Kent and across the South East of England. For more information on our self hire and operated hire services, or to find out more about our property maintenance services, do not hesitate to contact us. Fill out the form on the right, or call us directly on 01243 262714 to speak to a member of our expert team. We hope to speak with you soon.